Panzer IV the backbone of the panzer divisions in WW2. During WW2 the German Army (Heer) had revolutionized the use of armored warfare by using their "panzers" to concentrate a huge number of units to strike a spearhead through the enemy's defensive lines. Much of armored combat tactics, prior to the invasion of Poland in 1939, had used the tanks sparingly spread out across wide lines making them ineffective. With the added implementation of the Luftwaffe (Air Force) to attack ground based targets and support the German panzers, the "Blitzkrieg" (Lightning War) was conceived. Now having said all that about the "Blitzkrieg", the panzers were of course used in a defensive manner. As the war turned in favor of the Allies, the Germans started defending the territory they had captured, then subsequently lost and eventually had to fight for the "Fatherland" of Germany itself. So, I ask the question...what was the single most important panzer tank used by the Germans during WWII? 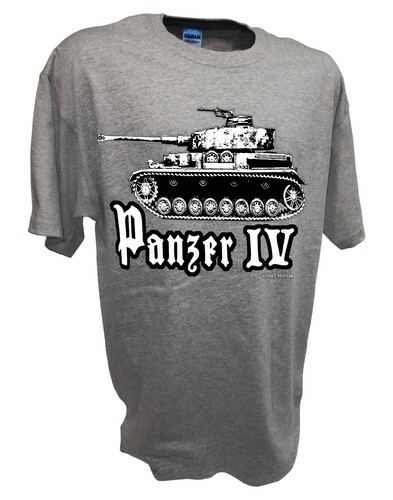 We all know of the fearsome Tiger 1 and the Panther, but what of the Panzer I, II, III or IV? Let's start with the Panzerkampfwagen VI...the "Tiger". The Tiger made a psychological impact on the morale of the enemy due to its long range deadly 88mm gun and the heavy frontal armor (120mm), which made it seem indestructible. The Tiger was too massive at 56 tons and no sloping armor like the Panther tank which allowed the weight to be much lower. Only about 1350 produced, but started in 1942 and the majority late in the war... too late and too costly. The Panther was considered the greatest tank the Germans had by many military experts, but the initial action was mired by mechanical issues and fires. After those bugs were worked out the Panther went on to have about 6,557 tanks produced. The Panther had better frontal armor than the Tiger, due to the sloping, and was quicker and handled tough terrain better as it was much lighter at 44 tons. The Panther had its debut at the Battle of Kursk in 1943 starting with 84 operational Panthers. Within two days, the number of operational Panthers had dropped to 40 due to breakdowns and enemy engagements. From then on the Panther was always outnumbered and never had the chance to really make a large impact. The Panzer IV production was just under the III's with 13,522, it was the only tank to be manufactured during the entirety of the war. The Panzerkampfwagen IV started off with a 50mm gun, then had to match the Soviet threat from the T-34's and KV-1's that were being fought against in 1941 for the first on the Eastern front and had to upgrade to the 75mm gun. The Panzerkampfwagen IV was and all around "workhorse" for the Germans and was in many of the major battles in all theaters of operations.The Pzkpfw III's had 16,409 produced but were medium panzers that kept getting firepower upgrades to keep up with the Russian tanks like the T-34.The I and II's had a valuable impact in the early stages, but were quickly outclassed by the T-34's.My vote would go to the Pzkpfw IV for the most important tank to the Germans in World War 2. The Panzerkampfwagen IV was much like the Allies' Sherman or the T-34 tanks, where hugh numbers overwhelmed the high quality, low quantity German panzers. The Panzer IV was improved with each version, except near the end of the war, where resources were limiting performance upgrades. Had the Germans "cranked" out more of the IV's, they would have had more spare parts, lower costs, higher rate of production and just more tanks to wage war. The Panzerkampfwagen IV (Pz.Kpfw. IV), commonly known as the Panzerkampfwagen 4, was a medium panzer developed in Nazi Germany in the late 1930s and used extensively during World War Two. Its ordnance inventory designation was Sd.Kfz. 161.Designed as an infantry-support tank, the PzKpfw IV was not originally intended to engage enemy armor—that function was performed by the lighter Panzer III. However, with the flaws of pre-war doctrine becoming apparent and in the face of problems T-34 tanks, the PzKpfw IV soon assumed the tank-fighting role of its increasingly obsolescent cousin. The most widely manufactured and deployed German tank of WW2, the Panzerkampfwagen 4 was used as the base for many other fighting vehicles, including panzer destroyers and self-propelled anti-aircraft guns. Robust and reliable, it saw service in all combat theaters involving Germany, and has the distinction of being the only German tank to remain in continuous development throughout the war, with over 8,800 produced between 1936 and 1945. Upgrades and structure modifications, often made in response to the appearance of new Allied tanks, extended its service life. Generally these involved increasing the PzKpfw IV's armor protection or upgrading its weapons, although during the last months of the war with Germany's pressing need for rapid replacement of losses, design changes also included retrograde measures to simplify and speed manufacture. The Panzer IV was the most widely exported panzer in German service, with around 300 sold to partners such as Finland, Romania, Spain and Bulgaria.The PzKpfw IV was the brainchild of German general and innovative armored warfare theorist Heinz Guderian. In concept, it was intended to be a support tank for use against enemy anti-tank guns and fortifications. Ideally, the tank battalions of a panzer division were each to have three medium companies of Panzer IIIs and one heavy company of Panzer IVs. On 11 January 1934, the German army wrote the specifications for a "medium tractor", and issued them to a number of defense companies. To support the Panzer III, which was to be armed with a 37 millimetres (1.46 in) anti-tank gun, the new vehicle was to mount a short-barrelled 75 millimetres (2.95 in) howitzer as its main gun, and was allotted a weight limit of 24 tonnes (26.46 short tons). Development was carried out under the name Begleitswagen ("accompanying vehicle") , or BW, to disguise its actual purpose, given that Germany was still theoretically bound by the Treaty of Versailles. MAN, Krupp, and Rheinmetall-Borsig each developed prototypes, with Krupp's being selected for further development. The chassis had originally been model ed with a six-wheeled interleaved suspension, but the German Army amended this to a torsion bar system. Permitting greater vertical deflection of the roadwheels, this was intended to improve performance and crew comfort both on- and off-road. However, due to the urgent requirement for the latest panzer, neither proposal was adopted, and Krupp instead equipped it with a leaf spring double-bogie suspension. The prototype required a crew of five men; the hull contained the engine bay to the rear, with the driver and radio operator, who doubled as the hull machine gunner, seated at the front-left and front-right, respectively. In the turret, the panzer commander sat beneath his roof hatch, while the gunner was situated to the left of the gun breech and the loader to the right. The turret was offset 66.5 mm (2.62 in) to the left of the chassis center line, while the engine was moved 152.4 mm (6.00 in) to the right. This allowed the torque shaft to clear the rotary base junction, which provided electrical power to turn the turret, while connecting to the transmission box mounted in the hull between the driver and radio operator. Due to the asymmetric layout, the right side of the panzer contained the bulk of its stowage volume, which was taken up by ready-use ammunition lockers. Accepted into service as the Versuchskraftfahrzeug 622 (Vs.Kfz. 622), assembly began in 1936 at Krupp-Grusonwerke AG's factory at MagdeburgThe first mass-produced version of the Panzer IV was the Ausführung, A (abbreviated to Ausf. A meaning "Batch A"), in 1936. It was powered by Maybach's HL 108TR, producing 250 PS (183.87 kW), and used the SGR 75 transmission with five forward gears and one reverse, achieving a maximum road speed of 31 kilometres per hour (19.26 mph). As main armament, the vehicle mounted the Kampfwagenkanone 37 L/24 (KwK 37 L/24) 75 mm (2.95 in) panzer gun, which was a low-velocity gun designed to mainly fire high-explosive shells. Against armored targets, firing the Panzergranate (armor-piercing shell) at 430 metres per second (1,410 ft/s) the KwK 37 could penetrate 43 millimetres (1.69 in), inclined at 30 degrees, at ranges of up to 700 metres (2,300 ft). A 7.92 mm (0.31 in) MG 34 machine gun was mounted coaxially with the main gun in the turret, while a second machine gun of the same type was mounted in the front plate of the hull. The Ausf. A was protected by 14.5 mm (0.57 in) of steel armor on the front plate of the chassis, and 20 mm (0.79 in) on the turret. This was capable only of stopping artillery fragments, small-arms fire, and light anti-tank projectiles. After manufacturing 35 tanks of the A version, in 1937 assembly moved to the Ausf. B. enhancements included the replacement of the original engine with the more powerful 300 PS (220.65 kW) Maybach HL 120TR, and the transmission with the new SSG 75 transmission, with six forward gears and one reverse gear. Despite a weight increase to 16 t (18 short tons), this improved the panzer's speed to 39 kilometres per hour (24 mph). The glacis plate was augmented to a maximum thickness of 30 millimetres (1.18 in), and the hull-mounted machine gun was replaced by a covered pistol port. Forty-two Panzerkampfwagen IV Ausf. Bs were manufactured before the introduction of the Ausf. C in 1938.717 This saw the turret armor increased to 30 mm (1.18 in), which brought the panzer's weight to 18.14 t (20.00 short tons). After assembling 40 Ausf. Cs, starting with chassis number 80341 the engine was replaced with the improved HL 120TRM. The last of the 140 Ausf. Cs was produced in August 1939, and production changed to the Ausf. D; this variant, of which 248 vehicles were produced, reintroduced the hull machine gun and changed the turret's internal gun mantlet to an external one. Again protection was upgraded, this time by increasing side armor to 20 mm (0.79 in). As the German invasion of Poland in September 1939 came to an end, it was decided to scale up fabrication of the Panzerkampfwagen 4, which was adopted for general use on 27 September 1939 as the Sonderkraftfahrzeug 161 (Sd.Kfz. 161). In September 1940 the Ausf. E was launched. This had 50 millimetres (1.97 in) of armor on the bow plate, while a 30-millimetre (1.18 in) appliqué steel plate was added to the glacis as an interim measure. Finally, the commander's cupola was moved forward into the turret. Older model Panzer IV tanks were retrofitted with these features when returned to the manufacturer for servicing. Two hundred and twenty-three Ausf. Es were produced between September 1940 and April 1941.